My mom is the unsung hero who took the brunt of my childhood frustrations head on. With adult wisdom I realize that she really was there for me when I needed her the most. 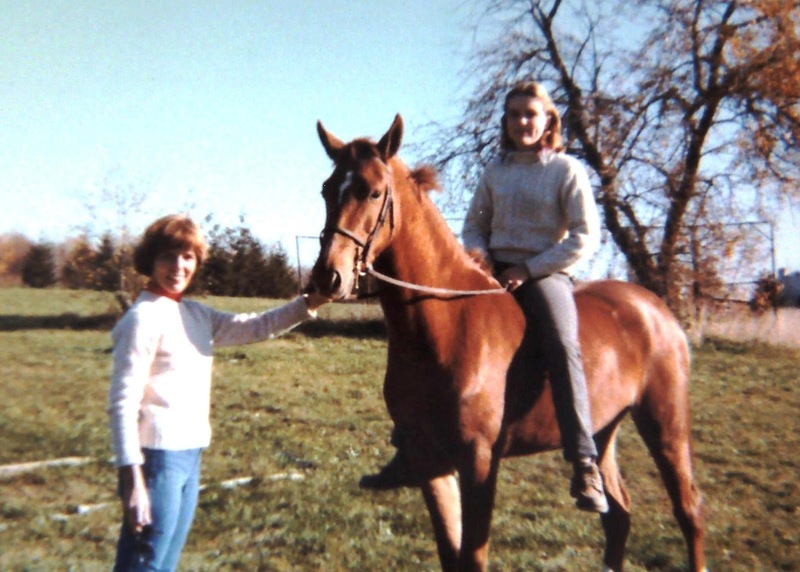 Unfortunately, my teen immaturity prevented me from accepting the fact that she really did go out of her way to bring horses, that we could afford, into my life. Every Saturday she drove me out to my riding lesson, a 2 and 1/2 hour commitment. It wasn't enough. She sent me to an overnight camp where I would be with horses EVERYDAY for a whole month. It wasn't enough. Then she created the most beautiful custom made riding coat for me to wear in my budding horse show career. It wasn't enough. Although the coat was a subtle burgundy, my eyes saw RED and red was a forbidden color to wear in the horse show ring. The following is an excerpt from my first article that was published in Practical Horseman Magazine, Oct., 2004. The full story, (and pictures of the red coat), can be accessed in the Published Articles listed at the right, on my blog. Why am I not surprised that my mother would once again play an important role in my budding career as a writer? Thanks Mom, and Happy Mother's Day to you and to all the unsung hero Mom's who do what they do for those they love! The anxiety brought on by the red coat was gone. Of course, there were no compliments either but blending in with the crowd was what every sixteen year old girl needed to be successful in life. I was on to something, wasn't I? After high-school graduation, the red coat accompanied me through all the drastic life changes one makes. With horse showing on hold during those uncertain years, I never wore it, but it always moved with me: from closet to closet and from dorm rooms to a number of apartments where I lived in my early twenties. Finally, it came to rest in a storage closet at the house that my husband and I lived in. For years it hung in that closet collecting dust, as I went about establishing a professional career as a schoolteacher and a life with horses in my backyard. In 1995, I purchased a five-year old dark-bay Thoroughbred gelding, (Zambezi). I trained him for two years, then was pleased enough with his progress to decide he was ready for his first horse show. Eager to show him off, I wondered how to make him stand out among all of the other dark horses he'd be competing against. ....Riding to the in-gate on show day, I felt confident. My horse with his gleaming dark coat and me with my subtle maroon coat stood out, just as I had hoped, among the endless sea of dark horses and riders in navy and black and gray. I thought of my mother, realizing that I was approximately the age she'd been when she sewed the red coat for her horse-crazy daughter. I wished she could see how proudly I wore it with no hint of the painful cringes she'd witnessed so many years ago, and hear the compliments from friends and fellow riders who smiled when I told them it had been made for me by my mother so many years ago. Reprinted from The Red Coat, Practical Horseman, Oct., 2004. My Mom, (left), Promise and me. Great post Anne. I was just thinking of people in my life who have passed on as I wrote my last blog post and one of them was my mother. She, too, took me to many shows and did so much for me. I was often a teenager focused on the things I saw wrong about her and not all she did for me. I have a coat story too. I often share it when I tell others how my mom always followed through on her parental reprimands. Something that doesn't seem to be done enough these days. She bought me this beautiful wool tan plaid coat with a brown velvet collar and the velvet helmet to match. We were at a show and it was raining. She asked me to put on the plastic hat cover and raincoat to protect the coat and hat. Of course, I was too cool and didn't want to wear the ugly raincoat and cover. She said if I didn't we would be leaving. I still said no and immediately I was told to dosmount and we were loading up and heading home. Not a happy drive, but a good lessoned learned! She did so much for me and I am glad that I am now able to appreciate all she did and honor her on Mother's day as well! Thanks for 2 great coat stories! Anne, when I glanced at the photo above I thought your mom was YOU!